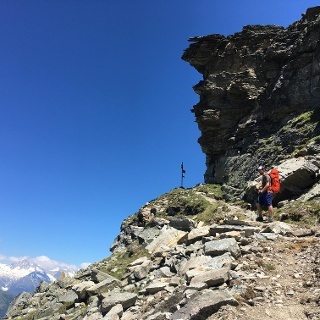 Panoramic high-level hike that showcases Saas-Fee from different angles and reveals the power of the glaciers that sculpted this bewitching landscape. 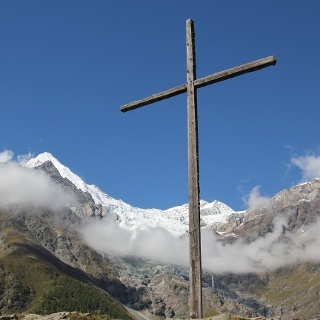 The Gemsweg (“Chamois Trail”) links the top stations of two gondolas on either side of Saas-Fee: the Hannig, to the north-west, and the Plattjen, to the south-east. 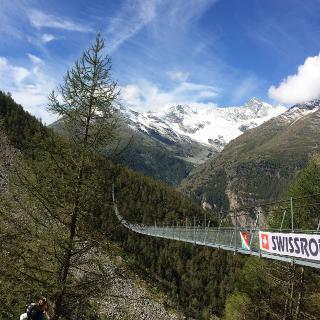 The roughly semi-circular route reveals views of Saas-Fee from three sides as it leads through the spectacular glacial landscape that attracted the first international visitors more than 150 years ago and continues to bewitch guests today. 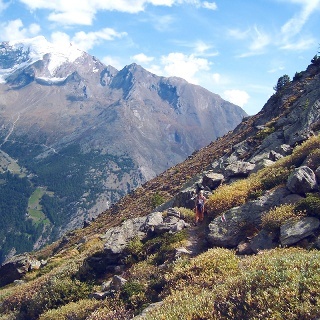 The hike begins at Hannig, accessible from Saas-Fee by gondola. The first half of the walk leads downhill across the mountain slopes to the west of the resort, eventually reaching the crest of the former lateral moraine of the Fee Glacier. The ridge offers a fine view of the young landscape revealed by the retreating glacier: a stony valley decorated with a lattice of rivulets flowing into a glacial lake. Two centuries ago, all this lay under a river of ice: the atmosphere is magical. Our trail follows the ridge downhill before traversing this new riverscape upstream of the lake. A climb through the forest leads to the Gletschergrotte, a mountain restaurant with sun terrace that offers a handy refreshment stop. Beyond, the trail initially follows a roughly level route through the forest, crossing a pair of glacial rivers along the way. The path then climbs steadily beyond the treeline, eventually reaching the Plattjen ridge by the Berghaus Plattjen – said to be the oldest mountain restaurant in the valley. The path then follows the steep ridge to reach the top station of the Plattjen gondola. The latter half of the walk, especially, offers good chances of spotting wildlife including chamois. These agile and shy goat-antelopes can run at up to 50 kph and jump 2 metres vertically in the air. You’ll need patience and a keen eye to spot them! Visit the restaurant Gletschergrotte and taste local dishes from Valais. The restaurant’s name is due to a glacier grotto, which was accessible at this place a few decades ago. Inform others of the route you plan to take. Whenever possible, avoid going alone. Take note of the warning signs that point out the constant danger in river beds and along watercourses below dams and reservoirs: water levels may rise rapidly without warning. From the top station of the Hannig gondola, the trail leads initially south-west, crossing the Torrenbach and Triftbach rivers before descending gently to Trift. After a steep downhill zig-zag section, the trail traverses the rocky slopes to reach the former lateral moraine of the Fee Glacier. Our route follows the crest of the moraine downhill, but at the junction turns sharp right to cross the river bed upstream of the glacial lake. 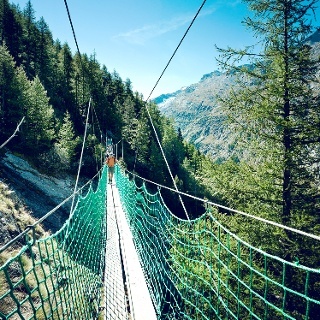 Beyond, the path climbs through forest and rocky slopes to reach the Gletschergrotte restaurant. This latter section from river to restaurant is also the final stretch of Saas-Fee’s fascinating Gletscherlehrpfad (Glacier Trail): 12 information panels show how glaciers have shaped the landscape. Beyond the restaurant, the trail crosses two more branches of the glacial river before embarking on a steady climb to the Berghaus Plattjen restaurant and up the Plattjen ridge to the gondola station. Train to Visp; change on to postal bus to Saas-Fee. Short walk (10 min) from bus terminal to gondola station for Hannig. 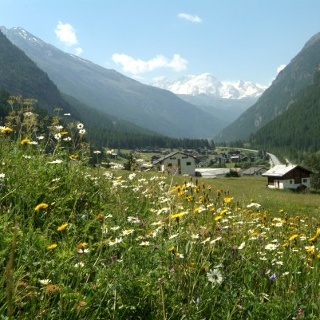 At end of walk, take gondola from Plattjen back down to Saas-Fee. Find full timetable information at sbb.ch. A9 motorway and main road up the Rhône valley to Visp. Turn south up the Vispertal valley, following signs for Saas-Fee. 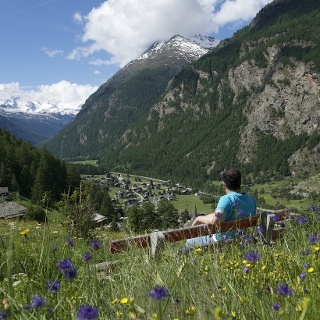 Saas-Fee ist car free. Multi-storey car park at entrance to Saas-Fee. The tourist office in Saas-Fee has got brochures and information material about hiking in the region.